One of the responsibilities that comes with ownership of ‘lifestyle blocks’ is weed control. 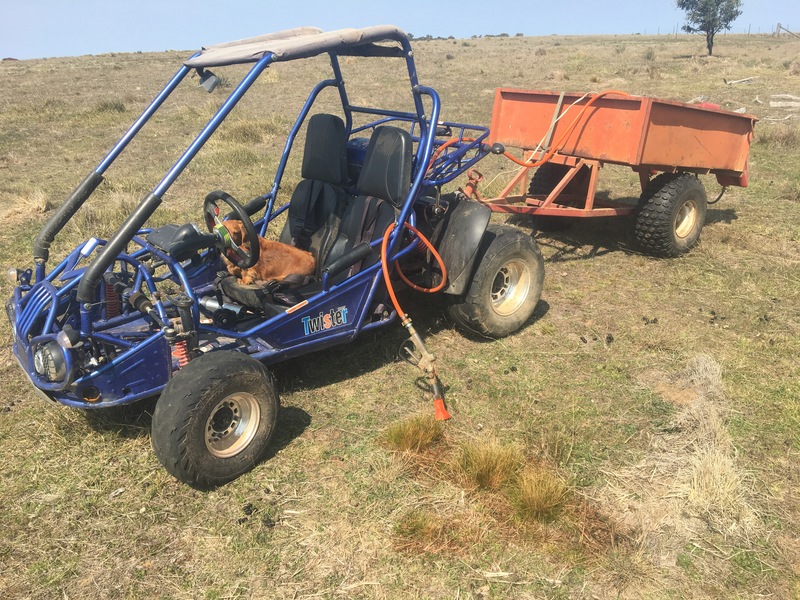 The Rock Farm is no exception – and whilst growing lush pasture is difficult here, it seems that weeds take particular pleasure in growing on our farm. 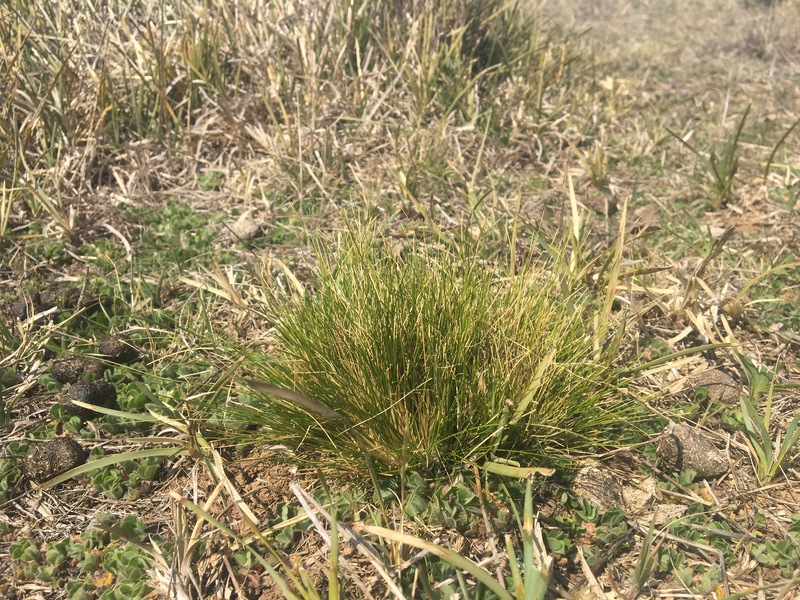 One of the weeds we have to control is serrated tussock (nassella trichotoma). This is a weed of national significance. It is not palatable to stock and large amounts can significantly reduce carrying capacity. Serrated tussock came to Australia from South America in the 1850’s. With no other commercial use, it was used as a stuffing in horse saddles. During the gold rush, Australia received a huge influx of new immigrants, and one of the unintended by products of this mass immigration was the introduction of many pests. A couple of years ago, we learnt how quickly it spreads. What I thought was a small patch rapidly grew, and it took a local contractor, with a specialised spot spay set up four days to spray. 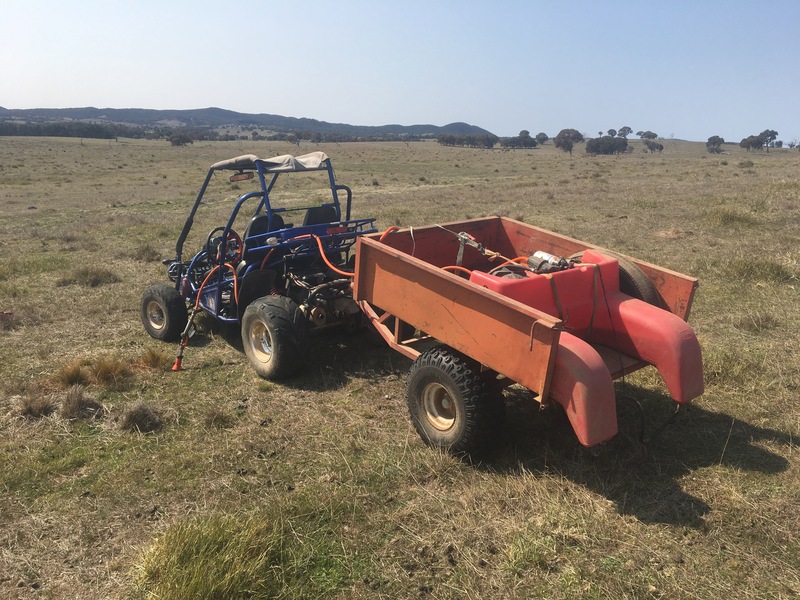 It is now a much simpler job, and a quick run through the paddock gets most of the tussock. My spraying rig is a combination of several contraptions, but it is effective for these smaller jobs. Whilst I would love to control the tussock without the use of chemicals, it simply isn’t cost effective. The cost of spraying per hour is roughly equivalent to the return made from selling one lamb. Chipping out the weeds is cheaper per hour, but takes around 4 times as long. With consumers willing to pay generally only a small price premium for organic lamb over the regular product, it is not effective for our business. For someone with limited time, spraying is definitely the way to go. Even with my cobbled together arrangement, I can cover a far greater area than if I was chipping out the tussock. The chemical burden is also very small considering the land area it is dispersed over. The supervisor also enjoyed the ride, however was far more interested in the passing kangaroos than pointing out the tussocks I’d missed! One of the greatest defences against serrated tussock is good ground cover. The seed is dispersed mostly by wind, the seed itself is not very competitive. Part of the large reduction in tussock numbers in this paddock has been, I think, our efforts in establishing a good pasture in the paddock and removing the stock. The planting of trees will further reduce the wind borne seed entering from the neighbour’s place (I hope). In the mean time, we continue to celebrate the arrival of spring on the Rock Farm.